Walton is one of the biggest manufacturers of electronic products in Bangladesh. Recently they launched their very first Android smartphone in the local market price just under $100. 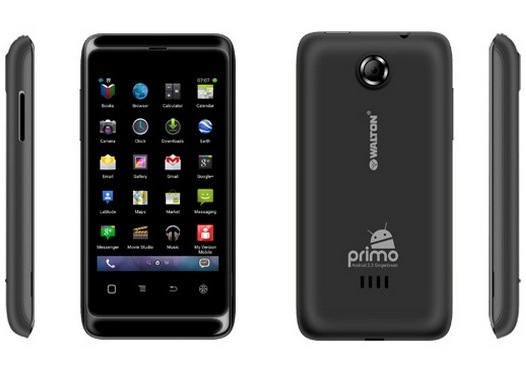 Walton Android Smartphone Primo has many advantages and modern functions. The user can use Dual SIM, GPS, GSM, WCDMA, Wi-Fi & EDGE. It has Qualcomm 1GHz Processor. The phone display is 3.5-inch and it is able to use up to 32GB Micro SD memory Card. Walton is giving 4GB card free with every handset. But unfortunately Primo has Android 2.3.6 Gingerbread built-in which is a now days very old! There is only 2MP camera on the back of the phone. Walton is charging only 7490 taka for this primo handset which is very very cheap by any standard.